When an overly empathetic orderly (Jerry Lewis) in a sanitarium discovers that his former high school crush (Susan Oliver) is a new patient, he does what he can to help pay for her costs — despite her obvious disdain for him. 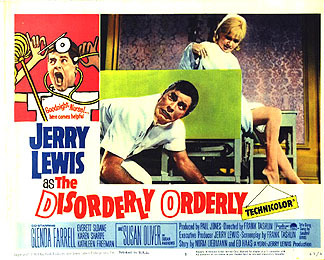 Peary is clearly an enormous Jerry Lewis fan, given that he lists no less than fourteen of Lewis’s many films in Guide For the Film Fanatic; with that said, while The Disorderly Orderly does possess several amusing sequences and performances (see Redeeming Qualities and Moments below), it’s ultimately not must-see viewing for all film fanatics. The central premise of the story — that Lewis’s Jerome Littlefield is too empathetic for his own good — is a sweet one, and it’s genuinely difficult to fault his character for being too caring. On the other hand, the central romantic subplot involving Jerome’s long-standing crush on a bitchy, undeserving blonde (Oliver) wears thin really quickly, particularly given the existence of his caring, patient, pretty girlfriend (Karen Sharpe) on the side; we can’t help wanting to shake some sense into Lewis! Ultimately, The Disorderly Orderly is worth a look by those who enjoy his unique brand of slapstick humor; others, however, needn’t bother. No, but it’s certainly a must for Jerry Lewis fans. As a budding ff, I saw all Jerry Lewis movies of the ’60s as they came out. (Not out of any particular devotion; I went to the movies every weekend.) For all I know, budding ffs today may find there’s enjoyment in these films. Myself, the only one I think holds up – and is a must for grown ffs as well – is ‘The Nutty Professor’ (more about that when the time comes). The odd thing about this film in particular is that all of the supporting cast come off better than Lewis; his shtick here is just too much of the ‘cry for help’ variety. (I esp. like, as noted, Alice Pearce’s delivery – her timing is impeccable.) The bottom line is this isn’t all that funny. The movie is produced well; as a crowd-pleaser, it looks slick. But I don’t think ‘goofy’ on its own has legs. Now, if it’s combined with something a little more inspired…as in, say, ‘Pee Wee’s Big Adventure’…well, then you’re talking.